Working with connections from within the BMSS Family as well as personal ones, this CD features a largely European lineup placing newcomers alongside well-known artists like Vertex, Solar Spectrum, Datacult and Elegy. 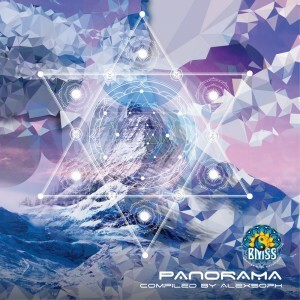 Alexsoph`s first solo compilation for BMSS Records presents a wide angle view on the space between Progressive Trance and Psytrance but flips it upside down. Using a selection of references cleverly pitched down, Alexsoph creates a space for a deep and hypnotic journey. Each track merges seamlessly with the next driving, intricate composition. Provocative intros and moving energetic textures are rounded out by no-nonsense throbbing beats and basses. Subtle atmospheres and deconstructed melodies work together to create a distinct depth that never looses it`s psychedelic vantage point. Sparse but well-placed elements manipulate the remaining space to create a low-pitched mysterious quality. Panorama is a brilliant, refreshing reinterpretation of the space between Progressive Trance and Psychedelic Trance. Mastered by Stryker.